Join guide Gitte Weise on the first walking tour of the year. 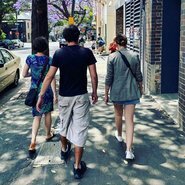 Discover the various art galleries around the Marrickville area, showcasing an array of established and emerging artists. Cancellations: Three full working days (Mon–Fri) notice is required to qualify for a refund. All refunds attract an administration charge of 25% of the ticket price(s) with a minimum charge of $5. Not negotiable.